all academics who want to understand the latest thinking on aging, personality, and dysfunction. -Victor Molinari, PhD, ABPPLouis de la Parte Florida Mental Health Institute University of South Florida ...this volume is a much-needed state-of-the-art compendium for both clinicians and researchers. -Michael Duffy, PhDTexas A&M University Improving quality of life for older adults with personality disorders This book provides a theorized pattern for each personality disorder in later life. 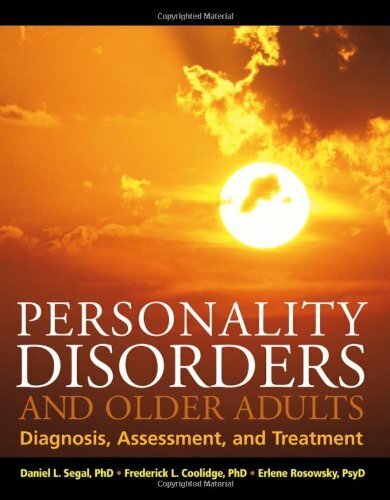 It examines the potential impact of aging on each of the personality disorders and offers extended case examples for odd and eccentric, dramatic and erratic, and fearful and anxious personality disorders as well as other personality disorders that affect older adults: sadistic, self-defeating, depressive, passive-aggressive, and inadequate. The authors offer guidance based on scholarly research and scientific evidence. The book covers epidemiology and comorbidity, theories of personality disorders, assessment, and intervention strategies. Personality disorder represents a tough and often frustrating challenge for clinicians. On top of this already challenging clinical situation, managing older patients entails contending with the physical and cognitive declines, social losses, reduced independence, and financial strains associated with the aging process. Armed with a better understanding of this very challenging clinical population, readers can help personality-disorderedolder adults age more gracefully and successfully, and help improve their quality of life. genetics and has established the strong heritability of gender identity and gender identity disorder. He also conducts research in lifespan personality assessment and has established the reliability of posthumous personality evaluations, and also applies cognitive models of thinking and language to explain evolutionary changes in the archaeological record. Professional Psychology, anbsp;Director of their Center for Mental Health and Aging, and a Fellow in the Gerontological Society of America.nbsp; Dr. Rosowskynbsp;is also well-published in the professional literature, and is a popular national speaker and workshop leader for both professional and lay groups. She serves as Chair of the Generations editorial board and wrote a column, Speaking of Aging, for the Journal of Retirement Planning. Dr. Rosowsky has authored and edited three books: Personality Disorders in Older Adults: Emerging Issues in Diagnosis and Treatment (1999); Personality Disorders in Older Adults: Diagnosis, Assessment and Treatment (2006) & Geropsychology and Long Term Care: A Practitionerï¿½s Guide (2008).Dr. Joseph Casciani is the President of Concept Healthcare, LLC in San Diego, CA, providing online, interactive training and live web conferences for those working with older adults, at www.cohealth.org.nbsp; He is also the director of a multi-state group delivering behavioral health services to residents in LTC facilities.nbsp; Dr. Casciani is licensed as a psychologist in the states of California, Texas, Pennsylvania, and New York, and is the President of Psychologists in Long Term Care for the 2008-2010 term.Dr. Merla Arnold is an independent practitioner providing geropsychology services, behavioral health counseling, consultation and education. Her clinical practice takes place in long term care settings in Western Suffolk & Eastern Nassau Counties, New York. Dr. Arnold is a New York State licensed psychologist and a member of the American Board of Quality Assurance and Utilization Review Physicians, a Certified QA/UR Professional; and a New York State licensed Registered Nurse. Dr. Arnold is the recipient of several awards and honors, including the ISABEL BELL Award. Inadequate Personality Disorder-A Manifestation of Frontal Lobe Syndrome?